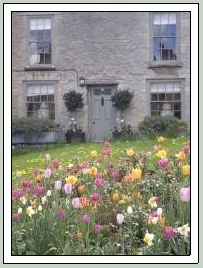 Highgrove, the residence of TRH The Prince of Wales and The Duchess of Cornwall is situated just outside Tetbury in the small village of Doughton. 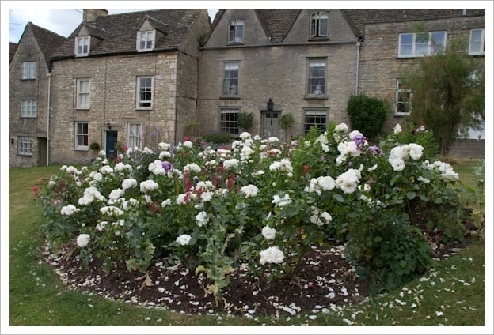 The residents of Tetbury have very strong links to the Highgrove estate so when Princess Diana died tragically in 1997, the Prince of Wales gave his permission for Tetbury to create a flowerbed in her memory. The bed was created on The Green and was originally planted with just 37 white Princess Diana roses, one for each year of her life. 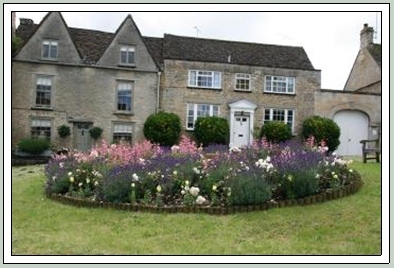 When the team formed in 2005, the roses were no longer looking their best so after a drastic prune and a good feed we added to them by planting lavenders and pink begonias. The whole bed took on a new look and the roses started to make a good recovery. By 2007 the lavenders had grown quite large so instead of under-planting with small begonias, we ’over-planted’ with tall penstemons in two shades of pink. The affect was quite stunning. The plants repeated their success in 2008 but we felt that the overall flowering season was not long enough and the lavenders had certainly become too big for their position. In Spring 2009, we removed all the lavenders and found them new locations, we kept the roses in place and rearranged some of the penstemons, adding a deeper shade of pink. We also added deep pink flowering heuchera and linaria, phlox and asters in shades of mauve and pink. No bedding plants at all are used in the Princess Diana Memorial flowerbed, which nevertheless looks good throughout the season, changing character as different plants come into flower. 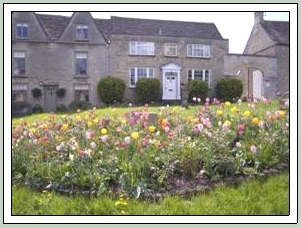 This is the best example of truly sustainable planting and has been something of a “test bed”. 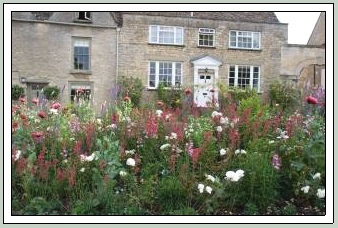 By late 2012 it was decided that the colour mix had become too wish washy and the phlox had become too tall. In the early Spring of 2013 the bed underwent a major overhaul. We removed the old log edging that had formed the boundary of the original planting. We reshaped the bed in to a semi circle or more subtly, a reclining 'D' shape. 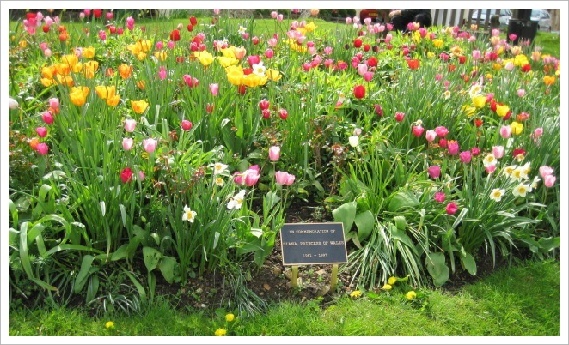 Keeping the original Princess Diana roses, all but the spring bulbs and heuchera were removed and planted in other areas around the town. In the summer we balanced up the bed by repositioning some of the tall phlox and added in several Hidcote lavenders and hardy 'Display' fuchsias to create a deeper colour palette. However, that still didn’t do what we were hoping for! 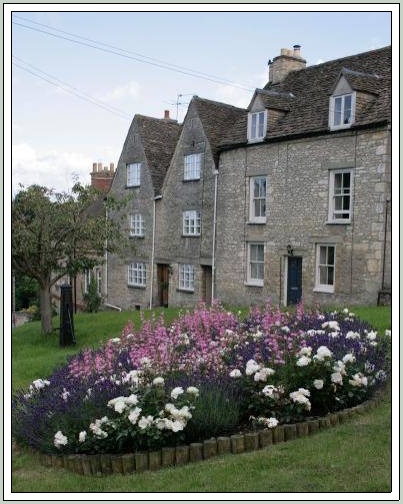 With a donation from the Tetbury & District Civic Society, in Spring 2014 a new cast bronze commemoration plaque was installed which replaced the original stone which had become illegible and damaged by weather erosion. By Summer 2017, with the pale mauve phlox getting way out of hand and becoming too dominant, we decided it was time for yet another major overhaul! In the autumn we blitzed the bed taking out everything out again apart from the 37 original roses and all the spring bulbs. 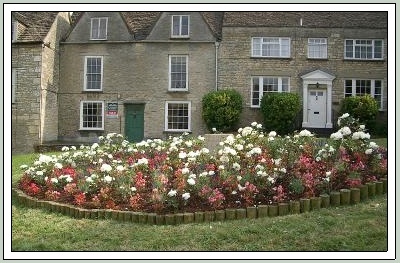 A more structured approach was taken using the roses as the mainstay throughout the bed. We replanted smaller clumps of phlox, pink japanese anenomes, crimson pentemons, pink and mauve hardy fuchsias, both the dark and green leafed heuchera, and added in some deep rose coloured chrysanthemums. All the plants were staggered toward the front of the bed according to their heights . Unfortunately, 2018 proved to be one of the hottest driest summers on record and the bed didn’t flourish to its full potential at all!. Even though the majority of plants survived, we’re still waiting with anticipation to see what summer 2019 brings and whether the look of the bed is how we imagined it should look!! Watch this space for an up-to-date photo!